Heidelberger Druckmaschinen (Heidelberger) is the global market leader in sheet-fed offset printing presses, and the Speedmaster XL 105 is the company’s top-of-the-line model, meeting the highest quality and productivity standards. Every year, the company produces up to 3,000 printing machines at its state-of-the-art facility in Wiesloch/Walldorf, Germany, for printing in various formats, which it sells to customers around the world. 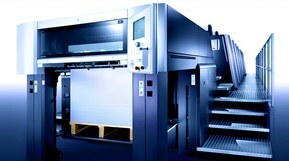 The Speedmaster XL 105 can be fitted with up to 16 printing units, and prints at a speed of up to 18,000 sheets per hour, in 70 cm x 105 cm format. The innovative technology incorporated in the machine is highly impressive: “It requires a perfect combination of mechanics, electronics and pneumatics,” explains Peter Kaufman, Heidelberger’s head of project planning. For many years he has sourced the cables and connectors necessary for the equipment from the Stuttgart-based Lapp Group, one of the leading suppliers of integrated solutions and products in the field. “Lapp’s in-depth application expertise, product quality, reliability of supply and excellent value for money mean we keep coming back to them,” says Volker Bender, who is responsible for purchasing electric components at Heidelberger. Heidelberger draws up precise wiring plans, which it provides to the control box and component manufacturers that supply the parts for the XL 105. These specify where each cable and each connector is to be positioned. As an example, one system with six printing units requires around 2.7 kilometres of cabling. Each printing unit has its own control box, made to Heidelberger’s patented design. These control boxes manage all of the printing unit’s functions, such as response to button inputs, sensors, end switches and drive positions, controlling pneumatic, hydraulic and electric actuators, and operating the damping und inking unit drives. All safety functions are designed with built-in redundancy. ÖLFLEX® 150 CY and ÖLFLEX® CLASSIC 110 connecting and control cables link the control box to the individual drives, such as those for the printing machine’s damping and inking units. Both cables are ideal for machine and plant engineering, are sheathed in PVC, and are flame-resistant. The copper braid of the ÖLFLEX® 150 CY provides additional shielding. In critical areas, such as within the printing unit itself, the cables are also fitted with an protective sleeve. Low frequency UNITRONIC® 100 data cables are used for the end switches and the control section. These control and signal cables are used primarily for electronic devices operating in the milliamp range, wherever compact dimensions and high conductor densities are necessary. Their outer sheath is robust, flexible and resistant. On the drive side, where ultra-precise gear wheels (with tolerances defined to the thousandth of a millimetre) interlock, the highly flexible ÖLFLEX® Servo FD 790 servomotor cable is employed. It is abrasion, oil and flame-resistant, and is sheathed in polyurethane (PUR). PUR is more flexible and provides greater resistance against aggressive chemicals than PVC, increasing service life. In addition, it is entirely free of plasticizers. The central control box of the Speedmaster XL 105 also contains low-frequency UNITRONIC® LiYCY data cables and SKINTOP® cable glands. This central control box is responsible for the supply of power to the machine. It houses the master CPU, the main drive, and peripheral units, such as the dryer, ventilation system, the cooling system for damping water and the powder spray. Heidelberger Druckmaschinen AG is with its sheetfed offset printing machines one of the leading solution providers for the print media industry. Headquartered in Heidelberg, Germany, the company focuses on the entire process and value chain for popular format classes in the sheetfed offset and flexographic printing sectors.